117 min. ThinkFilm. Director: Sidney Lumet. Cast: Ethan Hawke, Albert Finney, Marisa Tomei, Philip Seymour Hoffman, Aleksa Palladino. 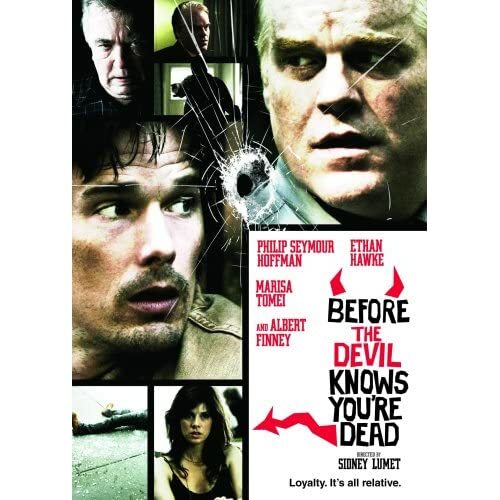 "The world is an evil place," or so says a compromised diamond dealer in the crime melodrama Before the Devil Knows You're Dead. "Some of us make money off of that, and others get destroyed." Dark but immensely satisfying, the 45th feature from still-spry 83-year-old Sidney Lumet finds the great American filmmaker—already responsible for Dog Day Afternoon, Network, The Pawnbroker, and 12 Angry Men, among others—delivering once again. Lumet casts Philip Seymour Hoffman and Ethan Hawke as Andy and Hank Hanson, two financially desperate brothers who collude to rob a jewelry store. Naturally, it's much more complicated than it sounds, thanks to past and present family history involving their parents (Albert Finney and Rosemary Harris) and Andy's wife Gina (Marisa Tomei). Crime doesn't pay in Kelly Masterson's diabolically structured script, as he piles layer upon layer onto an initial armed robbery scene. The reasons why two brothers rob a jewelry store have a lot to do with personal desperation but as much to do with broken marriages and dysfunctional family dynamics. Fraternal power games and jealousies play out under the shadow of Freudian implications, culminating in a horrifying one-two punch of scenes involving Hoffman and Finney having it out. While the film is a pleasingly sour study in sweaty anxiety—underpinned by Carter Burwell's insinuating score—Masterson, Lumet and the actors also tease mordant humor out of the extreme situations. That's especially true for Hawke, as the gaping semi-innocent despairingly on the way to becoming a deadbeat dad, and therefore easily led by the nose by his overbearing, bluff brother. Both men are at wit's end, but Hoffman gets the more viscerally intense role. First, he nails an old-fashioned theatrical monologue about Andy's longing to fill an existential void. As he explains essentially to himself, "My life doesn't add up. I'm not the sum of my parts. All my parts don't add up to one me." Soon, Andy has a full-fledged meltdown behind the wheel of the car. It's an astonishing, full-bodied performance, with crucially natural reactive acting by Tomei. Speak what we feel, not what we ought to say. Shall never see so much, nor live so long. 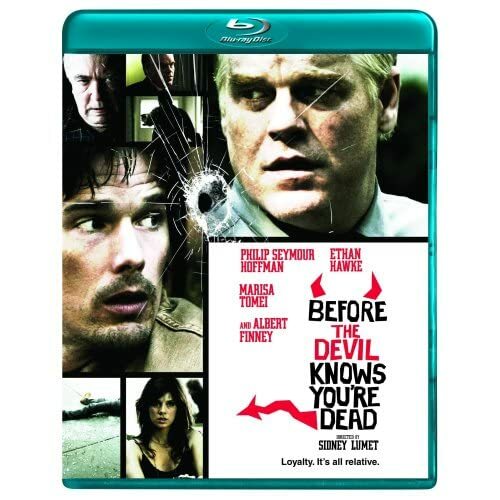 On DVD and particularly on a most impressive Blu-Ray, Before the Devil Knows You're Dead shines. The Blu-Ray picture looks better to me than the film did in the theatre, no doubt owing to the carefully cultivated film-like look that Lumet got out of (surprise!) an HD-CAM. Low-light scenes have a bit of extra grain to deal with, but this is an excellent transfer, with a killer DTS track to match. We also get a spirited commentary with Lumet, Hoffman, and Hawke, which gets into the ins and outs of making the film, delightfully esoteric actor talk (intent and action, internalizing dialogue, specificity, and the philosophy of Sandy Meisner), as well as more accessible topics, such as Katherine Hepburn, the women in the picture, and sexual dysfunctions of the stars. This one's a must-listen. Lastly, Image sees fit to include the "Theatrical Trailer" (2:00, SD). Lovers of great acting and, well, American film, owe it to themselves to pick up one of the finest films of 2007. All site content © 2000-2019 Peter Canavese. Page generated at 04/18/2019 05:40:14AM.